A Victorian County Court staffer has been sacked after being caught looking up highly sensitive information relating to Cardinal George Pell’s impending trial on historical sexual abuse charges. Source: Herald Sun. There are now fears that the major breach of security may have compromised the integrity of the criminal case. The Cardinal is due back in the County Court today for a directions hearing before Chief Judge Peter Kidd, during which the security breach is expected to be raised. It is understood the employee gained access to the restricted information through the court’s computer system. Exactly what data was accessed is not known, but the breach must have been recent: the court has only had the case since it was sent for trial by a magistrate a fortnight ago. The Herald Sun reports that all court staff have been warned about accessing information on cases without authority, with a particular focus on the Cardinal’s case. The employee was sacked within hours of the discovery of the breach, on the day it occurred. A court spokeswoman said: “The court takes the management and security of information seriously and has systems in place to detect where information is accessed without authority. When improper access to information is found to occur, the court takes decisive action. This is exactly what has occurred in this case. Defence lawyer Robert Richter QC said it would be inappropriate to comment on the breach, but it is understood Cardinal Pell’s legal team is extremely concerned by it. 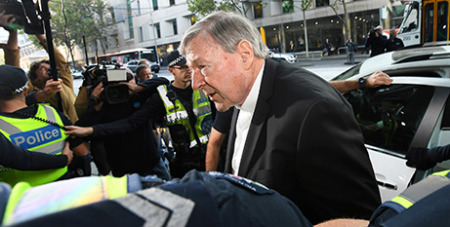 Cardinal Pell, who was charged last June, has vehemently denied wrongdoing. Meanwhile, The Age reports that the Victorian Department of Public Prosecutions lodged an application with the court on Friday for a suppression order over any media coverage of the trial. If the application is successful, it would mean the trial could not be reported until after the court proceedings are completed. It is understood the application is being made on the grounds that Cardinal Pell would not be given a fair trial due to the intense publicity which has surrounded the case to date. A trial date is expected to be set today.